Hot water tank and pipe insulation keeps water hotter for longer by reducing the amount of heat that escapes. This leads to cheaper energy bills and reduces emissions of carbon dioxide, a greenhouse gas that is harmful to the environment. Insulating pipes and a hot water tank is relatively straightforward and can cut heat loss by up to 75 per cent. Even if a tank already has a jacket, it is worth checking that it is at least 75 millimetres thick. If not, it is probably a good idea to invest in a new one. Fitting a hot water jacket is a simple job that most people will be able to take on themselves. It should only cost about £12 to buy one and in the first year it will knock £20 off energy bills and cut carbon dioxide emissions by 160 kilograms. Most jackets come in a number of segments held together by a cord at the top and belts that go around the tank. Make sure the tank is measured accurately before purchasing a jacket. They come in three standard sizes - 92 centimetres by 46, 107x46 and 122x46 - and new jackets should be at least eight centimetres thick. Turn off the heating and allow the tank and pipes to cool before carrying out any work. Tie the tops of the jacket segments tightly around the pipe at the top of the tank. Make sure the tank is completely covered, with thermostats, pipes and immersion heads in the gaps between the segments. Secure the jacket by pulling the belts, but do not compress the insulation too much. Where possible, let segments overlap slightly to prevent heat loss. 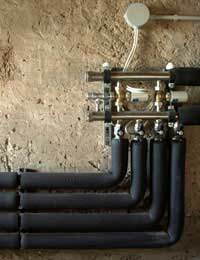 It is fairly easy to fit pipe insulation too, especially if the pipes are easily accessible. Professional help may be needed to fit insulation to harder-to-reach pipework, but materials should only cost around £10 and will pay for themselves within the first year, reducing carbon dioxide emissions by 70 kilograms in the process. There is no real need to insulate pipes within the living area, but it is worth insulating pipes between the boiler and the hot water tank, at least a metre of the pipe leading from the tank and any pipes in the loft. Any old or damaged insulation should be removed before starting. Types of pipe insulation can vary, but choose a lagging with a minimum thickness of 20 millimetres. The most convenient lagging to fit comes in pre-formed foam cylinders, which split along their length and easily slip over the pipe. Then just tape the splits and join sections. Some pipe insulation systems use purpose-made clips and it is possible to buy pre-cut packs to use around valves. Felt can be used as an alternative, as long as it is closely wrapped to the pipe until it reaches the required thickness. Avoid leaving gaps where pipes are fixed to joists in the loft or pass through walls, and be particularly diligent at junctions and bends. Cold water pipes in the loft or other cold parts of the house should be insulated too. Are Water-Efficient WCs Worth Installing?